Our products are manufactured from flat sheets (2.4 x 1.2 m) of recycled plastic, typically 6, 9 or 12 mm thick. We source these from a plastic recycler. Standard sheets are black in colour. A thin coating can be applied during manufacture to provide a coloured surface on one side. Additives are used to make the plastic ‘UV stable’, to minimise colour fade when exposed to sunlight. Sheets are smooth on one side and have a lightly textured ‘hatch’ pattern on the other. Our recycled plastic is made entirely from used food-grade plastic, primarily post-industrial waste. All plastic waste from the manufacturing process is returned for recycling to make more plastic sheet – this makes our manufacture almost a zero waste process. Some of our off-cut plastic is recycled to make the small 'Pi Clips' we supply to hold our housing together. Our metal fasteners are made from stainless steel or other rustproof alloys, to provide a long outdoor life. Being metal, they can all be recycled. Our cardboard packaging can be recycled, and we recycle cardboard boxes and animal feed sacks from the farm when additional packing material is needed. We do use some bubble-wrap, but even this is made from recycled plastic. We produce as little literature as possible. 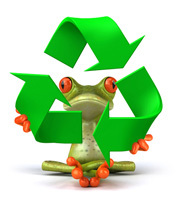 What we do produce is printed on paper with a high recycled fibre content. Our business cards, for example, are printed on 80% recycled card.